Summer’s not over yet! This is particularly true for Southern California with its wonderful climate. So, if you still have some vacation time available this summer or can manage a long weekend, we thought we’d inspire you with some road trip ideas with the kids and the dog in Orange County, California. We’ve done a few road trips with the whole family. For us, that means two somewhat responsible adults, two rambunctious, adorable (yes, I’m biased) kids, and 1 equally adorable (again biased), equally rambunctious dog. For our gang, there are 3 priorities on any vacation: entertaining days; good food; and a comfortable place to stay. Based on these criteria, this post considers the 3 Fs – fun, food, and fabulous accommodation. Where to begin? Orange County offers so much variety that it truly is difficult to know where to start. Corona Del Mar– dogs are allowed on the beach between 6:00 am and 10:00 am, then again after 4:30 pm. Huntington Beach Dog Beach– this is probably the most dog-friendly beach in the whole of the OC, very much like the city of Huntington Beach itself. It is the only permitted off-leash beach in the county. Salt Creek Beach Park– while you technically can’t take dogs onto the beach at Salt Creek, it’s a destination that’s not to be missed. There is a great park where lots of people enjoy taking the whole family (dogs included) to picnic, shoot hoops, and enjoy the views of the ocean. You can enjoy the salty sea air without getting sandy. Depending on what time of year you go, you may even get to spot a whale or even see the Tall Ships Festival. Dana Point Harbor– there is minimal beach access here, but there is mile after mile of harbor front where you can walk your dog and ogle at the gorgeous boats that are moored at the harbor at the same time. The city also hosts a wag-a-thon event annually, which can be fun for the family. Laguna Beach– there are dog-friendly beaches to explore, but be warned that those in South Laguna are not included in this. There are also specific times of year when dogs are allowed on any of the beaches in Laguna. These are notably off-peak periods September through May. Thankfully the Southern Californian climate is typically such that you can often enjoy being on the beach during these off-peak months too. Newport Beach– leashed dogs are allowed on these beaches before 10:00 am and after 4:30 pm. 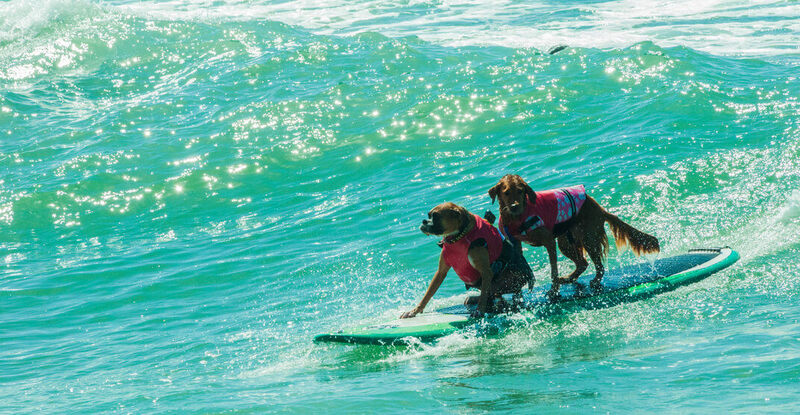 San Clemente– the only beach where leashed dogs are allowed is the San Onofre State Beach to the south of the city and there is a fee to enter this park ($15 per day [price correct as of May 2017]). With the Southern California weather being so dependable, there are several outdoor malls throughout the county. The most notable are Fashion Island at Newport Beach and the Irvine Spectrum in Irvine. Dogs on a leash are permitted through the mall at both locations. Some stores will even allow well-behaved dogs to enter but check with the store first. Younger kids love to look at the koi fish at Fashion Island and watch the fountains at both malls (they can play in some of them). Irvine Spectrum also offers a little train, a Ferris wheel, and a carousel. There are quite a few locations that offer more active play for kids, but dogs are not permitted entry to these. Places such as Boomers in Fountain Valley offer go-karting, miniature golf, bumper boats, and rock wall climbing – but you will need to find a dog sitter for a day. If you’d rather watch sports than participate, there is always the option of going to Anaheim to watch some baseball or hockey, but again this is not for the pooch in your life. It is hard to avoid making Disneyland a destination on an OC road trip. The kids will love it and many adults love going there too. Although only service dogs are eligible to enter the park, there is the option of the Disneyland Resort Kennel Club. This offers a climate-controlled daycare for dogs so that their owners can visit the theme park. It is available on a first-come-first-served basis and all animals must be accompanied with proof of vaccinations. Attendants are not permitted to handle or feed the animals, so owners must return to care for their pet every few hours. There is a hugely diverse range of foods available, ranging from some incredible fast food joints to upscale restaurants. You are literally spoiled for choice. In the OC, the climate is such that it is comfortable to eat outside on the patio for much of the year and many of the restaurants will allow you to have a dog on the patio. Some of the outdoor restaurants even offer a menu for your pooch in addition to water dishes. There are some restaurants that will allow you to have a dog inside the restaurant, but policies do change, so calling ahead to a restaurant that has previously advertised itself as dog-friendly may be advisable before heading there. There are infinite lodging possibilities to accommodate a whole range of budgets. Throughout the OC, there are many hotels and motels where pets are welcome. Some of the facilities have very specific terms and conditions regarding the number of pets allowed and the fees vary greatly so be sure to check these details before you make your reservation. Why not read about additional tips that can be good to know ahead of a visit in our blog post, Manners matter: etiquette at pet-friendly hotels? If you like the ability to prepare your own meals and have easy access to a washing machine while on vacation with kids it might be worthwhile renting a house or apartment. There are plenty of options available for your stay and some of these properties do allow pets. Camping (whether in an RV or in a tent) is an option for certain areas of the county. 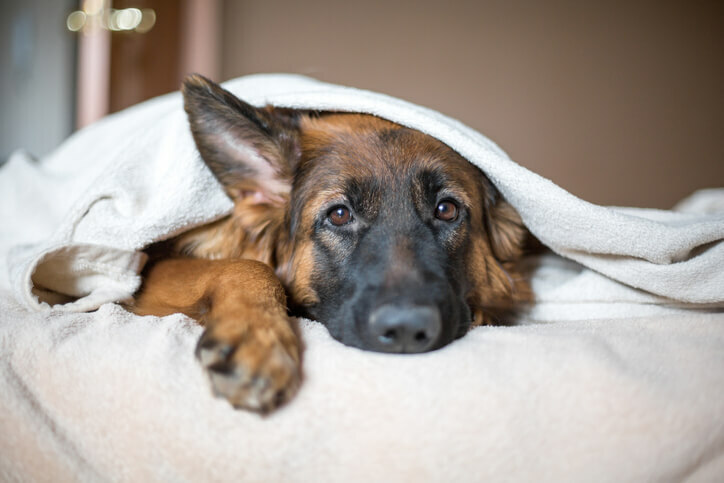 The following campsites currently permit dogs: Canyon RV Park, Anaheim; Doheny State Beach Park, Dana Point; Bolsa Chica State Beach, Huntington Beach; Newport Dunes RV Park, Newport Beach; San Clemente State Beach, San Clemente; and O’Neill Regional Park, Trabuco Canyon. 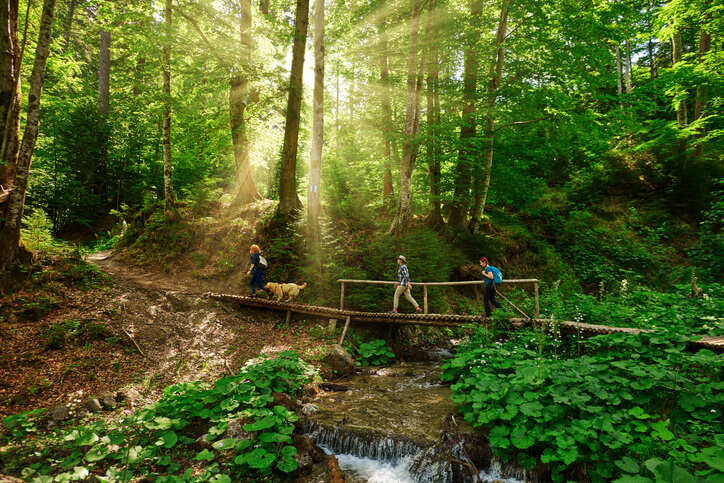 Each site has different regulations regarding dogs, so it is worth checking on the details ahead of your trip to make sure that the campsite meets your specific needs. This blog post barely touches the surface of the numerous things to do and see in the OC, but may give you a flavor of that part of Southern California. 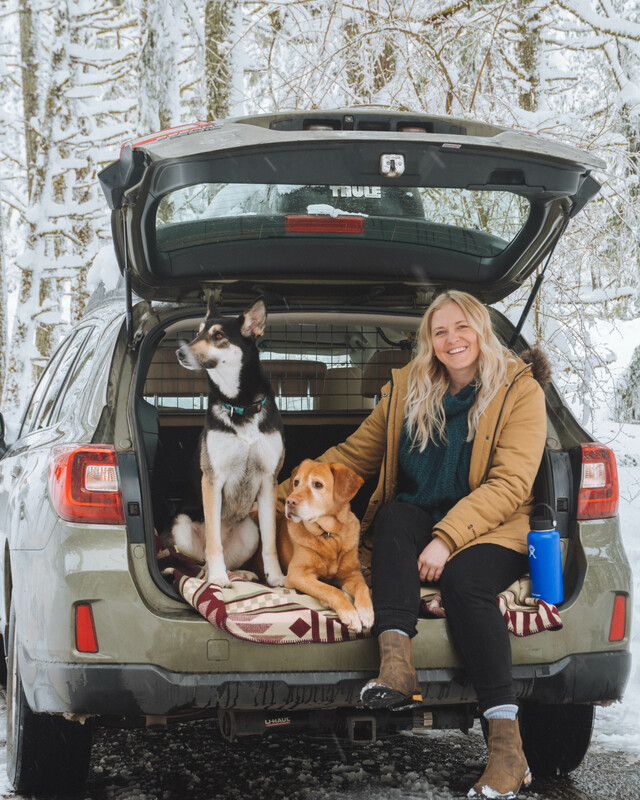 If you decide to take a road trip there with your kids and your pets, we hope you have the best time and enjoy long-lasting memories of those good times. Can you recommend somewhere you’ve visited that was great with the kids, with dogs, or both? We’d love to hear about your adventures.